“The iPads employ state-of-the-art iBeacon technology to trigger location based content enabling guests to dive deeper into the story of Elvis’ life through audio, video and photos from the Graceland Archives, much of which has rarely been seen,” Graceland says. 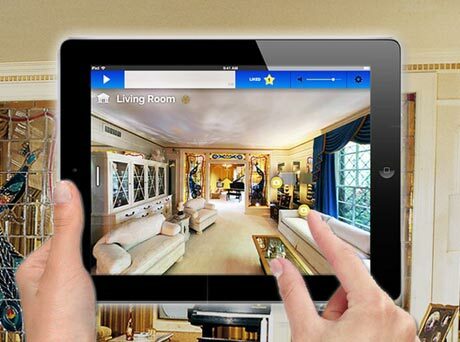 “The easy-to-use interface enables visitors to see each room at Graceland like never before. QTVR images offer panoramic views of each room. Visitors tap on designated icons on the screen to access unique, room-specific content throughout the tour. In key locations, archival photos and home movies taken from that exact spot in the home will be appear on the screen, providing visitors with an unprecedented, fully immersive tour experience. “Elvis was well known for being not only an early adopter, but a first adopter, and loved bringing the newest technology to Graceland, from one the first home VCRs, big screen TVs and remote controls to an early portable ‘briefcase phone’ and the very first microwave oven sold in Memphis,” says Joel Weinshanker, managing partner of Graceland LLC.